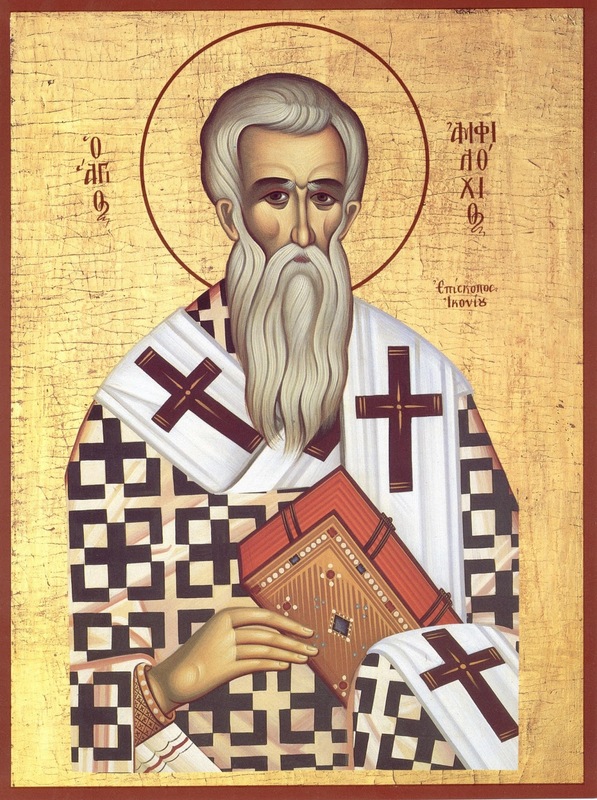 Amphilochios of Iconium was a cousin of Gregory the Theologian, and served as Bishop of Iconium (in Galatia) from A.D. 373 to 394. He wrote several books, but only a few poems and some other fragments from his writings have come down to us. His teaching on the canon is preserved in his Iambics for Seleucus (Iambi ad Seleucum), a didactic poetic work formerly attributed to Gregory the Theologian. The Greek text reproduced below is from vol. 37 of Migne's Patrologia Graeca, where the Iambics of Seleucus is printed among the works of Gregory the Theologian. Ἡ σεμνὸν ὄνομα τῆς Γραφῆς κεκτημένη. which has acquired the venerable name of Scripture. Κίβδηλα δ' ἐστί, ταῖς ὕλαις δολούμενα. but as regards their material are base forgeries. books one by one, so that you may learn them clearly. Τὰς τῆς Παλαιᾶς πρῶτα Διαθήκης ἐρῶ. I will first recite those of the Old Testament. μεθ' ἣν Ἀριθμούς, εἶτα Δευτερονόμιον. after which is Numbers, then Deuteronomy. Ἔσδρας ἐπ᾽ αὐταῖς πρῶτος, εἶθ' ὁ δεύτερος. after these, Esdras, one and then the second. Ἐκκλησιαστής, ᾎσμα τ' αὖ τῶν ᾀσμάτων. most wise in his deeds and words. Τούτοις προσεγκρίνουσι τὴν Ἐσθὴρ τινές. With these, some approve the inclusion of Esther. Time now for me to recite the books of the New Testament. fourth, but first in sublimity of dogma. Μέγιστον ἠχήσαντα τῷ Θεοῦ λόγῳ. who loudly sounded forth the word of God. Μίαν ἑκάστῳ, καὶ πρὸς Ἑβραίους μίαν. one each, and to the Hebrews one. but they say it not well; for the grace is genuine. Μίαν τε Πέτρου, τοῦ τ' Ἰωάννου μίαν. of Peter, and also Jude's, the seventh. Κανὼν ἄν εἴη τῶν θεοπνεύστων Γραφῶν. canon of the divinely inspired Scriptures.